On this day, 4th October, in 1936 large crowds of people gathered in London’s East End, an area of the city that had a large Jewish population, in an attempt to stop a march through the area by the British Union of Fascists (BUF). The protests turned into a riot with anti-fascist demonstrators clashing with Police, large numbers of demonstrators were arrested and even larger numbers of them (and Police) were injured. But they did manage to prevent the march from taking place. 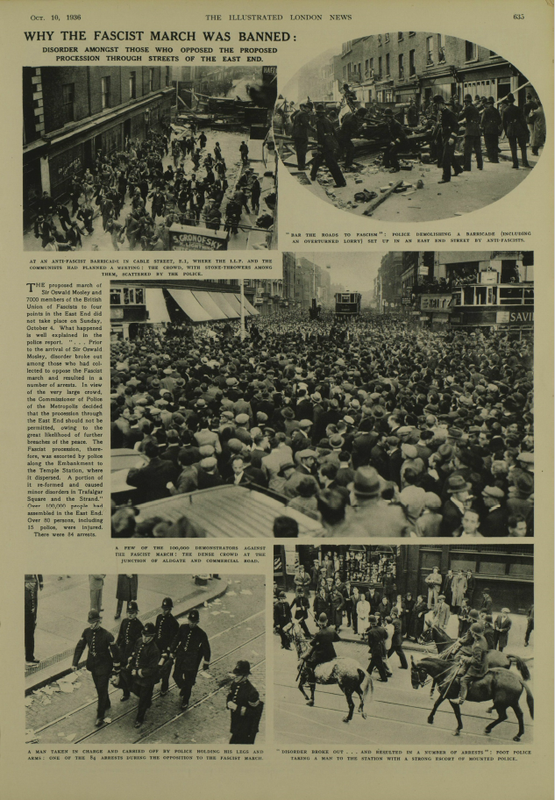 In this week’s blog post I’m using some of the Library’s digital newspaper databases to find primary source material about the Battle of Cable Street (as the demonstrations became known). Screenshot from Illustrated London News, October 10, 1936, p. 635. From The Illustrated London News Historical Archive. The British Union of Fascists (BUF) were formed by Sir Oswald Mosley (1896–1980) in 1932, emerging from the British far-right. Their supporters were known as “Blackshirts” due to the uniforms they wore (inspired by the Italian Fascists’ uniforms). While they had some limited success, the party never made it into mainstream politics and in 1940, after the outbreak of World War Two, it was banned by the British Government. Mosley and a number of other active fascists in the UK were interred for a period during the War. What did the papers say? The Library subscribes to a large number of digitised newspaper archives that will allow you to see what events were being reported on at the time and how they were being reported. Read full text articles, compare how different newspapers were covering the same issues and stories and track coverage of the growing Fascist movement in the UK in the early to mid-1930s, reports on the events of the day itself and the after effects (such as the Public Order Act 1936) and the subsequent decline of the Fascist movement leading into the Second World War. UK Press Online covers tabloid and popular titles from the 19th to 21st century Britain. The database includes 3 million pages from 1835 to the current day (updated daily) and titles include: Daily Mirror, Daily Express, Sunday Express, Daily Star, Church Times, The Watchman and more. 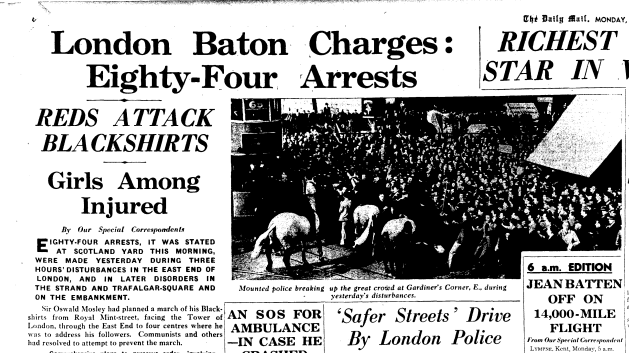 UK Press Online is particularly interesting when looking at the Battle of Cable Street and fascism in1930s Britain because its collections include BUF newspapers Action, Blackshirt and Fascist Week as well as the Communist newspaper Daily Worker. So you can read about events and issues from the newspapers doing their utmost to promote Fascism to the UK, while also reading about these same events and issues from a newspaper doing its utmost to discredit Fascism and promote Communism (with all the other tabloid papers in the database coming in at various different points along the left-wing <-> right-wing scale). Top: From front page of Blackshirt, October 3, 1936. It’s interesting to look at, from both sides, the language and rhetoric being used to describe and discuss the events and the people involved. While the Daily Worker, Blackshirt and Action have definite agendas it would be easy to think you’d get a more balanced view of events from the other tabloid and popular papers in UK Press Online but that is not necessarily the case. The Daily Mirror, for instance, was part of Viscount Rothermere’s newspaper empire. With Rothermere being an early supporter of the BUF, the reporting on this event was no doubt biased, though it may not always be so obvious at first. Screenshot from front page of Daily Mirror, October 5, 1936. From UK Press Online. Screenshot from The Daily Mail, January 15, 1934, p.10. From Daily Mail Historical Archive. The Daily Mail did begin to pull back from such outright support for the BUF but it remained a Conservative right-wing paper, Rothermere was a supporter and acquaintance of Hitler and G. Ward Price continued to write pro-Hitler and pro-fascist articles for the paper (including, just a few weeks before the Battle of Cable Street, an article called ‘This New Germany’ extolling the leadership of Hitler and the changes he had brought about to Germany). So when looking at their reporting of the events in London’s East End on the 4th October 1936 you do have to take into account these biases. They may not be as upfront as Rothermere’s ‘Hurrah for the Blackshirts!’ but they are there and tinged with a definite anti-Communist slant (The Mail’s pro-fascist leanings may have stemmed from Rothermere’s abhorance of Bolshevism). Screenshot from The Daily Mail, October 5, 1936, p. 13. From Daily Mail Historical Archive. Screenshot from The Manchester Guardian, October 6, 1936, p. 12. From ProQuest Historical Newspapers: The Guardian and The Observer. What did other papers say? 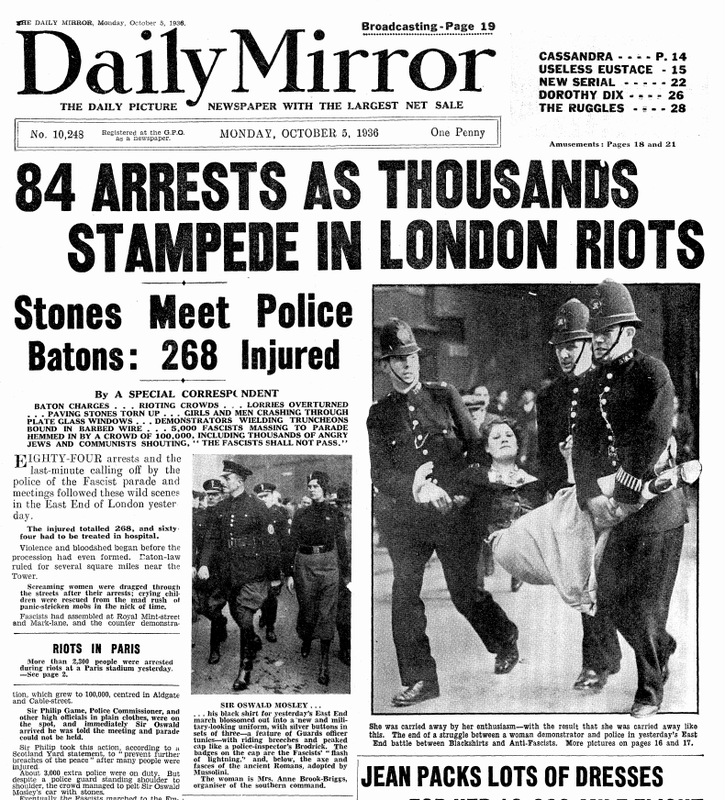 I’ve just highlighted three of our newspaper archive databases that you might want to use if researching the Battle of Cable Street or Fascism in 1930s Britain but there are others you can try as well, including both UK and international titles e.g. The Times Historical Archive, Illustrated London News Archive, Irish Newspaper Archive, The New York Times (ProQuest Historical Newspapers), etc. Screenshot from The Irish Times, October 5, 1936, p. 7. ProQuest Historical Newspapers: The Irish Times and The Weekly Irish Times. 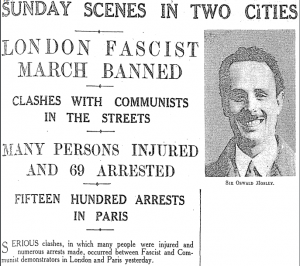 The Irish Times, while reporting on the Battle of Cable Street, also report on a much bigger clash between Fascist and Communist demonstrators in Paris on the same day. According to their report around 1,500 people were arrested. The Listener was a magazine created by the BBC and developed as the medium for reproducing broadcast talks. In a 1933 issue (22 March) they reproduce the speeches of both Oswald Mosley and Lady Megan Lloyd George (1902-1966) from a radio broadcast on the pros and cons of Fascism in the UK (Mosley gave the argument for, Lloyd George gave the argument against). It’s an interesting read and equally fascinating are the various letters to the editor this generates over the next couple of months, both for and against. Newspaper articles may be inaccurate. Not necessarily in a deliberate, “Fake News”, way but because they are often written with a tight deadline and may be poorly edited or incomplete. Newspaper articles may be biased (as we have seen with some of the examples above) and it can be useful to use a number of different sources to get a clearer picture of events and counteract editorial bias. You have your own biases, whether it’s about the events, issues, ideologies or people involved or about the actual newspapers themselves. Keep this in mind when doing your research and be prepared to read and consider views that you may not agree with. You can access all the digital newspaper archives I have mentioned above, along with a large range of other newspaper archives and magazine archives, via the Newspapers and Magazines databases list. Access to library databases are only available to current students and members of staff at the University of Edinburgh. “Mosley did not pass: East London routs the Fascists”, The Daily Worker, October 5, 1936, p. 1. UK Press Online. Accessed 24th September 2018. “For alien or for Britain?”, Blackshirt, October 10, 1936, p. 1. UK Press Online. Accessed 24th September 2018. “The organisation of terror”, Action, October 10, 1936, p.1. UK Press Online. Accessed 24th September 2018. “Opinion”, Daily Express, October 5, 1936, p. 12. UK Press Online. Accessed 24th September 2018. 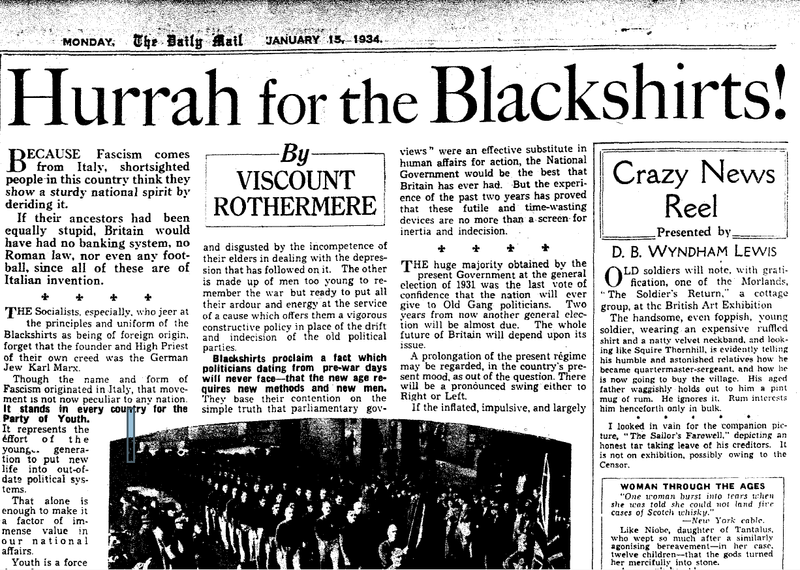 Viscount Rothermere, “Hurrah for the Blackshirts!”, Daily Mail, January 15, 1934, p. 10. Daily Mail Historical Archive. Accessed 24th September 2018. “The Fascist march”, The Manchester Guardian, October 5, 1936, p. 10. ProQuest Historical Newspapers: The Guardian and The Observer. Accessed 26th September 2018. 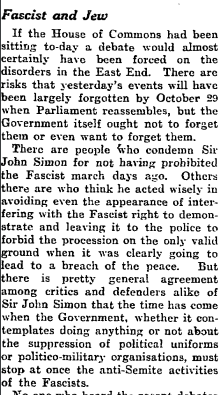 “Prohibited march in London”, The Manchester Guardian, October 5, 1936, p. 5. ProQuest Historical Newspapers: The Guardian and The Observer. Accessed 26th September 2018. “Fascist and Jew”, The Manchester Guardian, October 6, 1936, p. 12. ProQuest Historical Newspapers: The Guardian and The Observer. Accessed 26th September 2018. This entry was posted in Library, Online resource, Primary sources and tagged 20th century, Britain, cultural history, Databases, Europe, History, newspapers, Politics, primary source, social history, World War Two by cstirling. Bookmark the permalink.